Between the mysterious, almost inconceivable science of quantum physics and the mundane experience of working in a large organisation it would be hard to think of realms that are further apart. So Leadership and the New Science, by Margaret Wheatley, which seeks to apply insights derived from contemporary science to organisational life, is a book I approached with some scepticism. What possible relevance to the world of work could be found in the fundamental science of how matter functions below the level of the atom or how everything in the universe is inter-connected? These seem such big and incomprehensible questions that daily life is able to get along just fine without reference to them. Reading the book, though, I soon realised that it was precisely because my thinking was shaped by the insights of traditional science that I couldn’t see the relevance of looking at quantum mechanics. If the world is more complex and mysterious than traditional science described, why is management still drawing on analogies informed by eighteenth and nineteenth century concepts. Might not organisations be more complex and mysterious than traditional management theory describes? By the time I’d finished the book, I had the impression that it had come about half a century too late. It helped that I came to the book having not long before caught up with the absorbing TV series Atom in which Professor Jim Al-Khalili provided both a history and an explanation of atomic science that my layman’s brain could just about understand. Bringing the story right up to date, the series brought home to me how much science has moved on even in my lifetime, how different the world is from what scientists understood just a few decades ago. And that is the nub of Margaret Wheatley’s book. Our organisational analogies need to catch up with how scientists now undertand the world. She contrasts the new science with the Newtonian physics that preceded it. It’s not that Newton’s science has been rendered obsolete but that it doesn’t tell the whole story. Nor, therefore, does the broader thinking that science inspires. Mental constructs derived from traditional physics are all around us. We see the world as the sum of its parts which work together in an efficient machine: a largely linear process of cause and effect between one part and another. She overstates, I think, the extent to which this kind of thinking has been superceded and its “costly failures” acknowledged. To appreciate the gap, we need only look at the alternative that she constructs. Wheatley looks at developments not just in physics but across scientific disciplines. 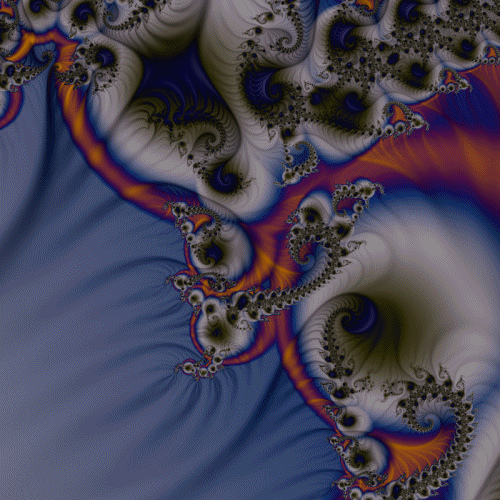 But it seems to me that quantum mechanics is the precursor to the rest, since it posits a radically different and challenging way of conceiving of things which provides the springboard for the other developments she explores such as chaos theory and self-organising systems. In place of the large machine, with its processes and parts, comes a holistic way of viewing things. It’s not the rigid stucture itself that matters so much as the entity as a whole; not so much the parts in the structure as the relationships between them. Instead of a stable, material universe, we have a dynamic, fluid system in which order is constantly created out of chaos. Apply this thinking to organisational life, and you soon arrive at a radically different view than prevails in most people’s experience of work. Instead of the command and control frameworks mapped out on organisation charts, we have complex networks where nodes of influence are distributed and found in unexpected places – not just among those formally invested with authority but also among those who hold informal influence. These may be people who are highly respected professionally, or who are sources of gossip or are subversive forces within the organisation. Instead of the division of labour, deskilled production lines and micro-management of people’s working lives, the new science leads one to expect fluid, emergent ways of organising work to be more effective. Instead of crude financial incentives which produce perverse results, better to focus on creating a clear and shared sense of direction and purpose at work, and then leave people to use their initiative and potential to collaborate together in common cause. We treat organisations as objective structures with a life of their own, but they exist only in so far as people come together and participate in them. It is more accurate to think of an organisation as a process rather than a structure. If you do so, you find you need a different model of leadership – one that is both more challenging for and easier on leaders, because it recognises the limits of their ability to command and control. In the organisation-as-process, leaders can really only facilitate. They achieve by nurturing achievement in others. This necessitates an adult-to-adult relationship with those they aspire to lead – helping the organisation to understand its values and to become – in Wheatley’s phrase – the standard it has set itself. Instead of information being regarded as a source of power, to be controlled, it is seen as the lifeblood of the organisation and made to flow freely. And when times are tough, this calls for honesty about the future and engagement with the innate intelligence and expertise of the team about the way forward. nships are acted out. Yet somehow, in years of organisational life, I lost track of this insight and became mired in the organisation as a structure with a life of its own. Nor did anything I learned at business school challenge this mechanistic view of the workplace. After I left organisational life to become self-employed, some my previous worldview began to re-emerge and I began to view my time in the organisation as a pathological experience. Deep down, while working inside the organisation, I had found many of its processes and structures dysfunctional but had somehow accepted them as the natural order of bureaucracies. But even at the time I could see that it was possible for the organisation to succeed despite itself. Little pools of creativity and innovation would cluster together and find ways around the system. People would ignore the established structures and find ways to make things happen. The big insight for me from reading Leadership and the New Science was that the processes that subvert authority are part of the necessary and natural order of events. Chaos and order go hand in hand, in organisations every bit as much as in natural systems. They need change and instability to renew themselves and survive. If an organisation is no more nor less than the people who participate in it, then simply to act within it is to change it. Since most of us are followers, even if we are also leaders, this is a very empowering message. It means we have it within ourselves to lead, to take ownership of the organisation and move it. We are all, in fact, leaders, even if we are also followers. We don’t need to wait for the bosses – whoever they may be – to get the message. 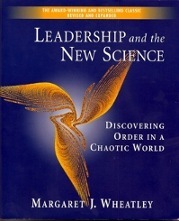 Leadership and the New Science by Margaret Wheatley. Image courtesy Santa Rosa OLD SKOOL. Previous Previous post: Why use a coach? Next Next post: What do you want from coaching?